“With only 5% of its sales going to firms based in the UK and a wide-spread of client industries Renishaw has a good insight into what is going on globally and it is always worth listening whenever this high-quality company speaks. Today’s profit warning and forecast of lower annual profits will therefore be a worry for investors, especially as Renishaw has suffered just seven drops in earnings in the past 25 years and they all came during times of a slowdown or recession around the world,” says Russ Mould, AJ Bell Investment Director. “Renishaw’s rare profit stumbles came in 1997 (Asian debt crisis), 2002 (bursting of the tech bubble and a US recession), 2007-2009 (great financial crisis) and 2013-16 (European debt crisis and stagnating global growth). Source: Company accounts, 2019E based on mid-point of revised guidance from management given on 21 March. 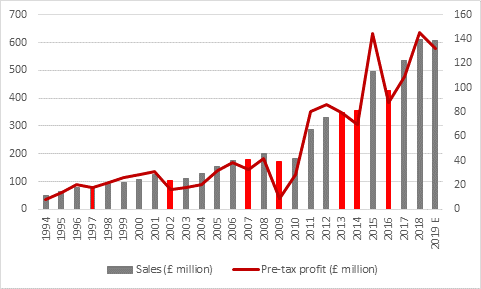 Years of annual profit declines marked in red. “It is therefore a concern to hear executive chairman David McMurtry and chief executive William Lee forecast a minor drop in sales and 9% drop in pre-tax income, at the mid-point of their guided ranges today. They cite weakness in Asia and particularly from customers in the consumer electronics business, which may well reflect a further slowdown in the smartphone market and the bloated inventories which have caused so much difficulty for silicon chip makers, whose products will be used by many of Renishaw’s customers and who will be in some cases direct clients of the Gloucestershire-headquartered firm’s metrology products. 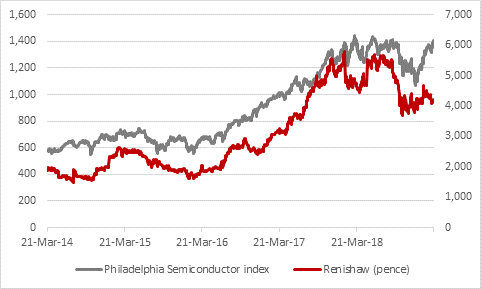 “Renishaw’s sober outlook contrasts markedly with the performance of technology-laden indices such as the NASDAQ Composite and particularly the Philadelphia Semiconductor Index, or SOX, which have rallied hugely this year. “They have been buoyed by management forecasts of a ‘second-half recovery’, a theme played by silicon chip maker Micron on Wednesday, even as the firm missed expectations for its latest quarter and guided profit forecasts down for the next one. “Micron’s move to idle some production, cut capital investment for 2019 and assess its 2020 spending plans hardly smacks of confidence in the second-half recovery scenario and that firm’s actions tally closely with the sentiments expressed by Renishaw today. “Silicon chips – semiconductors – are everywhere, from cars and computers, from smartphones and tablets, from video games to robotics and from display screens to data centres. As such they are good proxy for economic growth and broader end-market demand, a characteristic they perhaps share with Renishaw. “Note how Renishaw’s shares and the SOX seem to march in lockstep – although it does appear that Renishaw has been left behind of late. This suggests that either buyers of chip stocks are too optimistic or sellers of Renishaw too pessimistic and we will find out which soon enough, once chip makers start giving guidance for and then reporting their sales and profits for the third and fourth quarters of 2019. “This has wider implications. The SOX benchmark has traditionally been a good indicator of wider stock market momentum and risk appetite since its launch in summer 1994. 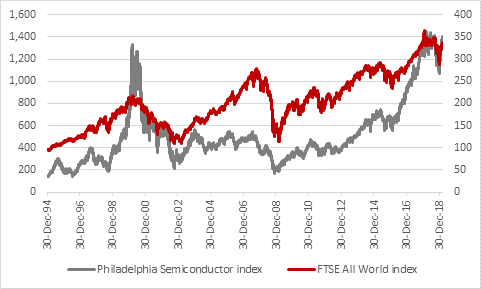 “The index peaked before the wider FTSE All-World benchmark in both 2000 and 2007 and bottomed before headline indices such as the S&P 500 began to find its footing in 2002 and 2009. Goldman Sachs today reaffirms its neutral investment rating on Renishaw PLC (LON:RSW) and cut its price target to 4100p (from 4570p). Our top picks of the year have got off to a great start with the portfolio up 14.1% versus 7.9% from the wider market. UBS today reaffirms its sell investment rating on Renishaw PLC (LON:RSW) and cut its price target to 3423p (from 3704p).